During the last few years Arriance Infra has graved his presence through its innovative and sustainable way of establishments. Every year Arriance Infra shows its presence differently across the industry. 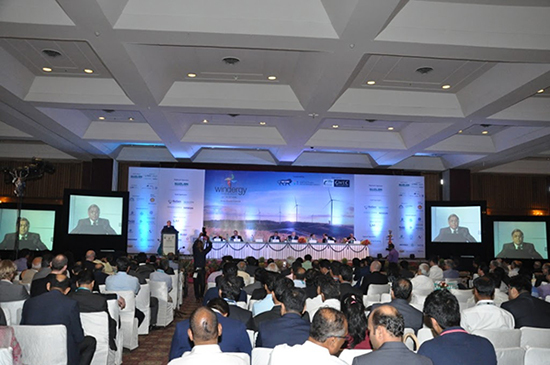 With the objective of fetching more investments in wind sector in the country, bringing in more international collaborator and promoting indigenous manufacturers to venture in International markets, IWTMA has partnered with the Global Wind Energy Council (GWEC) to organise a mega threeday exhibition and two-day international conference – ‘Windergy India 2017’ from April 25 to April 27 at Hotel Ashok in New Delhi, where leaders from across the globe would deliberate and discuss the way forward and come out with solutions to tide over the key barriers faced by the wind energy sector. Windergy India 2017 is a mega event by the industry and for the industry and the main theme of the event would be ‘Wind Destination:India’ and ‘Wind Power Forever’. Arriance Infra was Sponsor at this MEGA EVENT. We will focus on continuous R&D to harness technology and reduce Levelised Cost of Energy (LCoE) by increasing Plant Load Factor (PLF) and making low wind sites viable. Arriance Infra has witnessed an overhaul in terms of Technology and its wide range of products is testament towards the same. Our end to end solutions approach and presence across entire value chain from concept to commissioning, proven execution capabilities and dedicated Life Cycle Asset Management service provider gives it a strong competitive advantage over its peers. The Group also offers and executes best-in-class Operations, Maintenance and Services across the india. These divisions, with its proven track record of managing assets through its life cycle, has been a driving force in generating steady revenues as well as garnering customer confidence over the years.